We have a wide range of residential self contained bedsits, studio flats and flats for rent throughout North, South and Central Lowestoft. All our residential accommodation is self contained with private kitchen or kitchenette and bath or shower room. All our properties are managed and maintained by ourselves guaranteeing a professional, personal and efficient service. We are happy to receive applications from professional tenants and those in receipt of benefits. 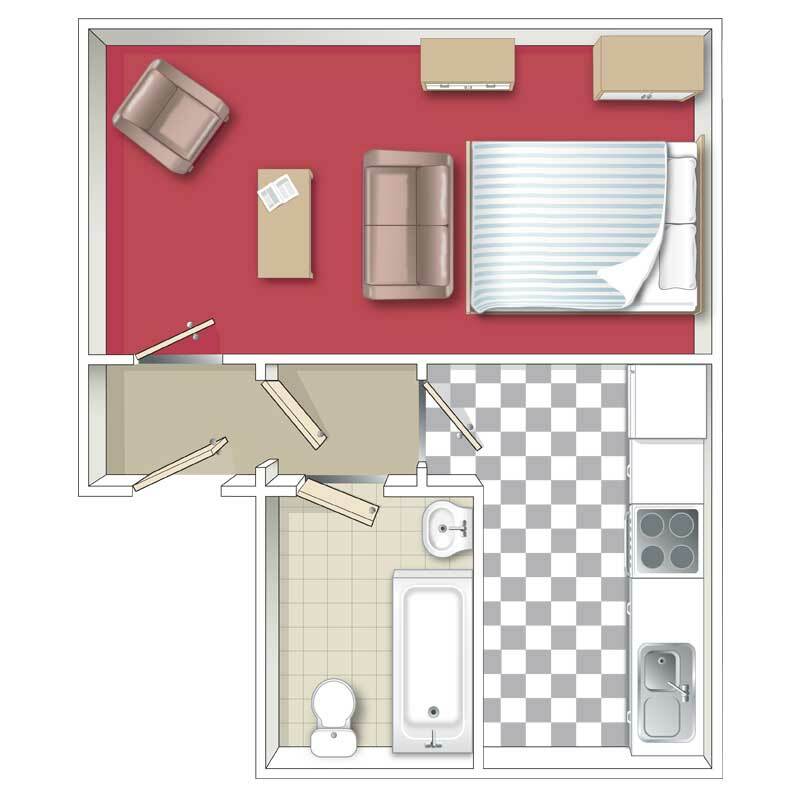 BedsitView Example- one open plan bed/living room with kitchenette and separate bath or show room with handbasin and wc. Bedsits are typically furnished with carpets, curtains, single bed, wardrobe, drawers, armchair and coffee table. The kitchenette has fitted units, cooker and fridge. Bedsits are only suitable for one person. 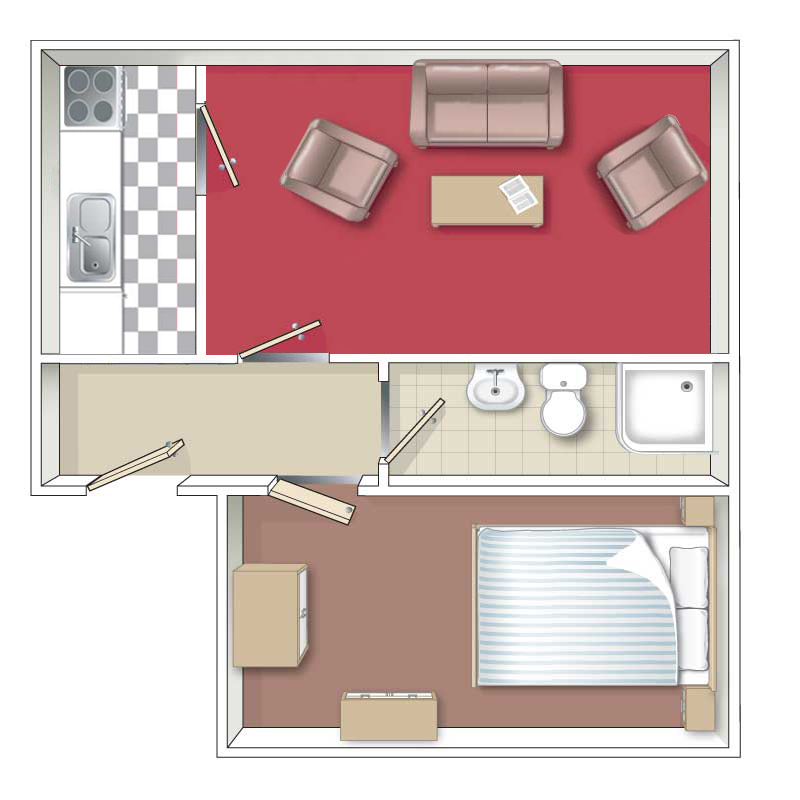 Studio FlatView Example - one open plan bed/living room with separate kitchen and bath or shower room with handbasin and wc. Studio flats are typically furnished with carpets, curtains, double bed, wardrobe, drawers, small sofa or two armchairs and coffee table. The kitchen has fitted units, cooker and fridge/freezer. Studio flats are generally only suitable for one person. 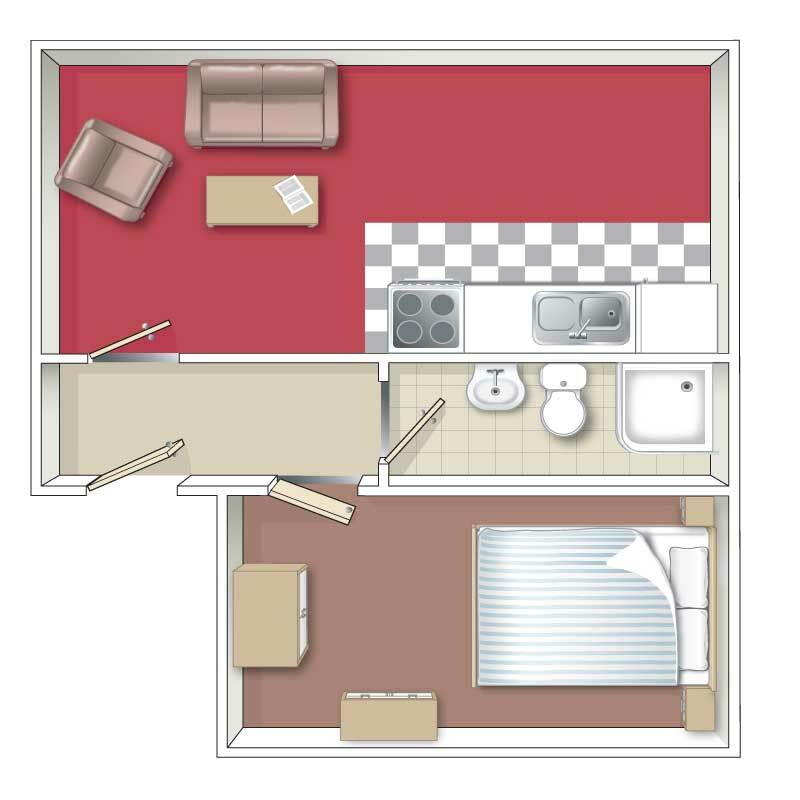 One Bedroom Flat with KitchenetteView Example - living room with kitchenette, double bedroom and separate bath or shower room with handbasin and wc. One bed flats are typically furnished with carpets, curtains, double bed, wardrobe, drawers, bedside cabinet, 2 piece suite and coffee table. The kitchenette has fitted units, cooker and fridge/freezer. One bedroom flats are suitable for up to two people. 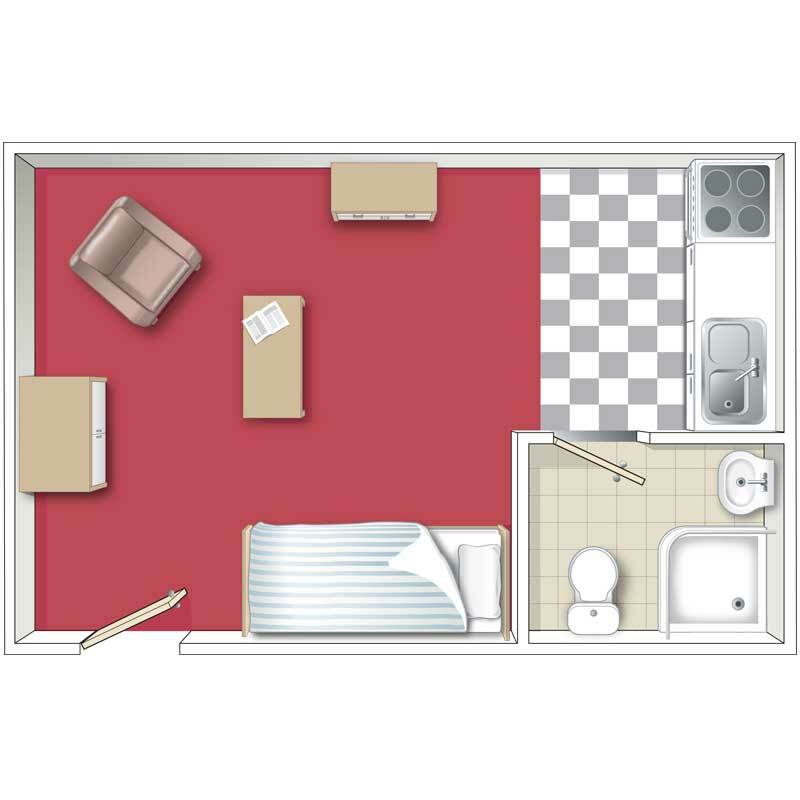 One Bedroom FlatView Example - living room, double bedroom, separate kitchen and separate bath or shower room with handbasin and wc. One bed flats are typically furnished with carpets, curtains, double bed, wardrobe, drawers, bedside cabinet, 3 piece suite and coffee table. The kitchen has fitted units, cooker, fridge/freezer and plumbing for a washing machine (machine not supplied). One bedroom flats are suitable for up to two people. Two Bedroom Flat - living room, 2 bedrooms, separate kitchen and separate bath or shower room with handbasin and wc. Two bed flats typically have one double bedroom and one single bedroom and are typically furnished with carpets, curtains, double bed, single bed, wardrobes, drawers, bedside cabinets, 3 piece suite and coffee table. The kitchen has fitted units, cooker, fridge/freezer and plumbing for a washing machine (machine not supplied). Three Bed Flat - living room, 3 bedrooms, separate kitchen and separate bath or shower bath or shower room with handbasin and wc. Three bed flats typically have two double bedrooms and one single bedroom and are typically furnished with carpets, curtains, 2 double beds, single bed, wardrobes, drawers, bedside cabinets, 3 piece suite and coffee table. The kitchen has fitted units, cooker, fridge/freezer and plumbing for a washing machine (machine not supplied). We also have a limited number of two and three bedroom houses which when available are let unfurnished. The properties we have available are constantly changing. If we do not have anything suitable for you at the moment please complete our Accommodation Application Form and we will contact you as soon as something suitable comes available. If you would like to arrange a viewing please contact us and we will be happy to make an appointment at a mutually convenient time.